Welcome to the Fu Shan Hai project! Here you will find as much information about MV Fu Shan Hai, as possible. If you have information, pictures or video, that we may share, please don’t hesitate in contacting us, or leaving a comment. Fu Shan Hai was built in 1994 at the Jiangnan Shipyard, at Shanghai, China. Speed 14,2 knots (26,3 kmh) fully loaded. Engine – B&W 8.466 kW (11.353 HP). Fu Shan Hai collided with the polish ship Gdynia on May 31st 2003, and sank several hours later. All 27 crew members were rescued and were transported to the hostel “Hasle Vandrehjem”. (As far as I can remember, this video was created by the Danish Home guard). Lots of good views from inside MV Fu Shan Hai. 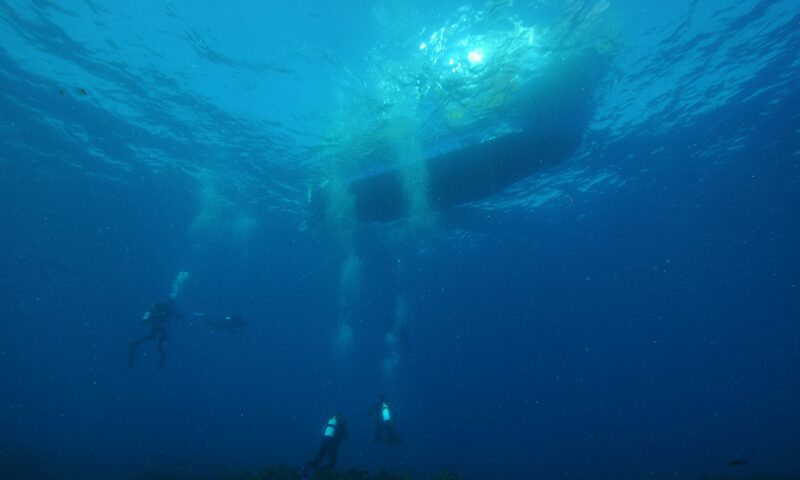 We are guided thru the vessels mess hall, bridge, offices and a bathroom during this dive. The mess hall is very well preserved, and chairs and tables still seem to be in a reasonable condition. An estimated 40 tons of oil has leaked the Fu Shan Hai’s tanks, and 10 tons have been collected by the environmental vessels “Mette Miljø”, “Gunnar Thorsen” from Denmark, and “202” from Sweden. 36,3 kilometres of the Swedish coast was also hit by the oil slick, and had to be cleaned. The prognosis for how the oil from the ship would spread. After more than 4½ years the final bill has been presented to the insurance company. The owners of the polish vessel “Gdynia” has previously paid aprox. 84 million danish kroner to the owners of Fu Shan Hai. How deep lies the Fu Shan Hai? 35 metres to the top of the ships main structure. 47 to 53 metres to the deck. 55 metres to the ships name plate. 70 metres to the screw. If you know more dive centres that kan bring visitors to the Fu Shan Hai, please place a comment.